One of the most frustrating realities of living with fibroids is that I always have to dress to try to hide my stomach. It’s easier to do some times than others. It depends on whether I’m in a stage where the fibroids are controlling me or in a stage where I am controlling them. They are always in control at that time of the month. There appears to be absolutely nothing I can do then to control the size of my stomach. My stomach gets extremely big and painfully uncomfortable when my cycle comes around and there’s no hiding my stomach at this time, unless I wear a tent. I have to avoid going out or make up my mind that people are going to think I’m pregnant. 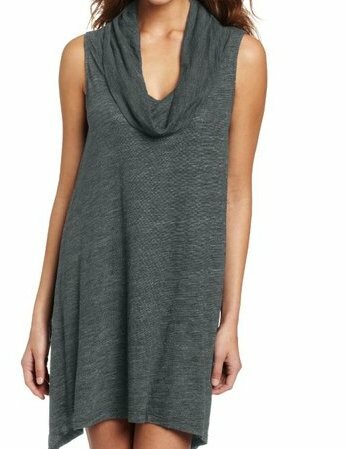 I figure if you have to look pregnant at least look fashionable at it so I plan to buy this allen allen Women’s Sleeveless Cowl Neck Dress at some point when I get the funds. It’s very frustrating to have this problem with my stomach, especially at this point when I’m probably in the best shape I’ve been. To look at my stomach and see all the evidence of the hard work I’ve been doing to get back to a high level of fitness destroyed by having this big protruding lump is annoying and at times depressing; but I try not to let it get me down. Most of what I have in my closet are things I bought before this problem developed so there are times when I can’t go anywhere because everything I own will just emphasize my ridiculous stomach. I do have to say that there are times when it’s not that bad. Like I’ve said in some of my other posts the fibroids do go down quite a bit when I’m not consuming much in the way of solid food; so if you’re trying to shrink your fibroids and you’ve heard people suggest a juice fast I’d say try it. I haven’t really done a dedicated fast the way it’s been suggested, as in going 30 days on a juice fast. I might try that starting in September when I should be able to afford it. A 30 day juice fast is not possible on my current budget. Could depression cause fibroids or fibroids cause depression?